Border Police officers present at Wednesday morning's car attack in A-Tur describe how training saved their lives. 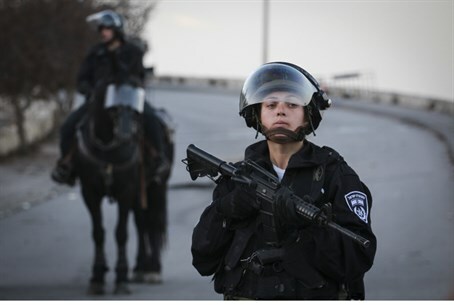 Arutz Sheva spoke to several Border Police officers who were at the scene of Wednesday morning's terror attack on Mount of Olives in the hours after the attack. "During my shift in A-Tur, I identified a terrorist's vehicle speeding up deliberately towards other officers," A., a Sgt. Second Class, stated Wednesday afternoon. "I quickly realized that it was a terrorist attack and that there was not a second to waste. I acted quickly to prevent more innocent people from being hurt." "We fired at the terrorist and neutralized him," another officer, who asked to remain anonymous, added. "It's one of the scenarios we were trained for, I have no doubt that it was over so quickly because soldiers are ready and prepared for any scenario." Border Police commander, Major General Amos Jacob, came to visit the two injured policewomen in hospital and praised the quick work of officers at the scene. "This is the third incident in a month in which Border Policemen thwarted an attack and prevented it from escalating," he reflected. "Recent events prove that accurate training works regarding lone terrorists who attack without any preliminary intelligence [on them] - vigilance starts and ends with the professionalism and determination of the officers." Earlier Wednesday, an Arab motorist mowed into officers standing guard in the Arab neighborhood of Jerusalem, injuring two officers. He was shot dead by officers at the scene after doubling back to confirm his kill. Tens of Arab rioters gathered at the scene and attempted to attack emergency responders.